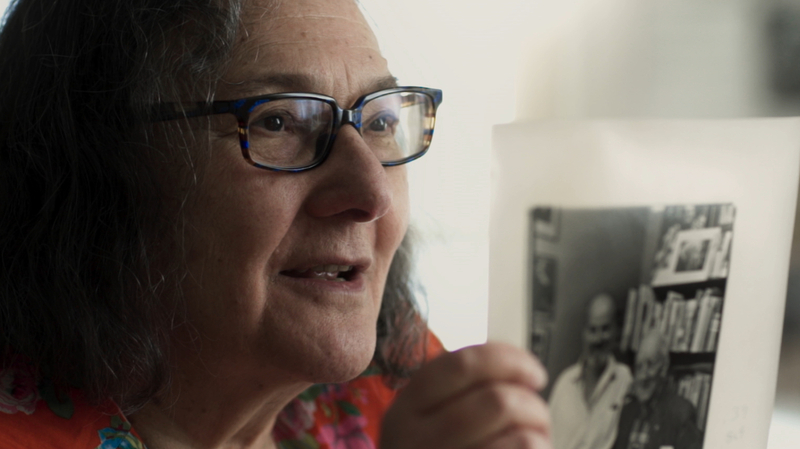 The Polaroid Photographer Who Captures 'The B-Side' Of Her Subjects' Lives Errol Morris' unusually straightforward documentary about portrait photographer Elsa Dorfman is as charming as its sunny, voluble subject. Elsa Dorfman in The B-Side. Among the photographs featured in the voluminous archive of photographer Elsa Dorfman, there's a joyful selfie — taken in 1988 before either the word or the practice became a thing — of Dorfman and her frequent subject, Beat poet Allen Ginsberg. Arms linked and holding hands, the two friends stand side by side, grinning broadly in unself-conscious camaraderie. Ginsberg is less known for his chipper outlook than for his sonorous meditations on lost America, and that goes double for filmmaker Errol Morris (The Fog of War, The Thin Blue Line). But once you've seen The B-Side: Elsa Dorfman's Portrait Photography, Morris's charming portrait of the portraitist, you'll see that that photo tells us all we need to know about Dorfman's approach to art and life. It has nothing to do with finding Ginsberg's inner essence, or anyone else's in her collection of luminaries and just plain folks. Dorfman is interested in surfaces, though not in a surface way. Clocking in at a trim 76 minutes, The B-side is as warmly affectionate as its subject, a close friend and neighbor of the director. Formally speaking it's also unusually straightforward for Morris, a bold innovator and master of the off-screen probing question. His noises off barely register here, and rightly so, for Dorfman, whom we see leafing through her collection in the Cambridge, Massachusetts backyard garage that serves as her studio, is easily set in motion. She proves a lively, free-ranging chatterbox on many subjects with the endlessly curious but practical intellect of the largely self-taught. The B-Side is about her evolving aesthetic, but it's also the autobiography of a woman who invented herself outside the often censorious jurisdiction of the art world. Imagine the reaction on the black-clad Manhattan gallery scene to this manifesto: "I have this misguided idea that it will be my role in the universe to make people feel better." Yes, she's that rad. A sturdy, maternal, but cheeky figure in dirndl skirts and fun sneakers, Dorfman talks in the flat vowels of her native Boston, to which she fled in her late twenties after working as a secretary in New York. To hear Dorfman tell it, her rich professional life took shape through a series of mostly fortunate accidents. That's true for most, but it takes a certain kind of openness and sense of adventure to spot and grab the opportunities that present themselves. This "lucky little Jewish girl who escaped by the skin of her teeth" worked at Grove Press, where she was exposed to writers and artists on the fringe. At that time it was "mortifying to be unmarried," she says cheerfully. "I had to have a thing." Back in Massachusetts in 1980, that thing became the analog Polaroid camera on which Dorfman took her large-format pictures for 30 years until the company declared bankruptcy, forcing her too to contemplate retirement. Hand-crafted in Edwin Land's workshop and weighing in at 200 pounds, the huge contraption, which has to be wheeled around on a dolly, is a monster of obsolescent beauty in today's digi-world, and it's charming to watch Dorfman and Morris coo over it as writers would over an ancient printing press. Hanging out in Cambridge's famous Grolier bookshop, Dorfman photographed her share of bohemian celebs from Ginsberg to Juan Luis Borges to Audre Lorde to Bob Dylan, all looking a sight more relaxed than their reputations suggest, which may be what earned her early art world opprobrium for being "too sunny." Yet even in the commissioned portraits of regular individuals and families from which she made a living, she never airbrushed and always told her subjects that they, not she, had to set the tone. She admits to "whipping up a certain energy" in the studio, and the pictures that she kept were the "B-side" rejects that her clients chose not to take, deglamorized and full of life and mischief and affection. There's nothing Pollyanna-ish or naïve about Dorfman. She's acutely aware, as any photographer must be, of the relativities of perception and the suspect nature of imposed narrative. Closing in on 80 years old, she's as lively as a cricket but sensitive to the precarious temporality of life and art, which is all about "nailing down the now." Her vivid Polaroids will erode, and she says she lacks the stamina to digitize her archive. So her work, which we see being packed away for storage, will fade, ironically, just as it has begun to attracted good notices. All of which she faces with the calm serenity of a woman who has spent her life doing the work she wanted to do. "Everything I did made sense if you knew me," she tells her friend. "I feel proud and incredulous. But I don't feel falsely modest."